Double duty built in seating in action. The semi circular stone bench functions as seating for the fire pit area and is also a retaining wall for the newly constructed upper garden level! 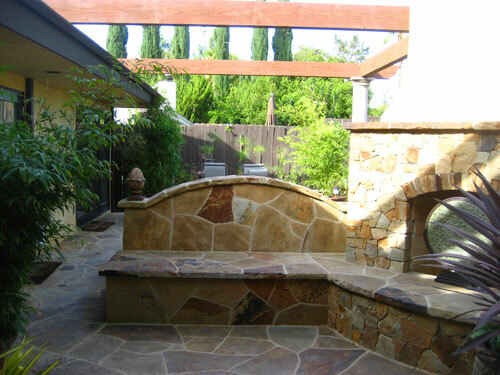 Many homeowners start their landscape construction projects in the fall and winter in Los Angeles so that they can be “outdoor living and entertainment ready” for the summer. If you have visions of hosting crowds that are bigger than your outdoor furniture can accommodate, you should seriously consider incorporating built in seating into your landscape. The beauty of built in seat walls is that they serve a variety of functions. My raised vegetable garden planter is both garden and furniture! My kitchen garden is conveniently located across from the cooking area so that I can pluck fresh herbs and vegetables for my dishes Â and entertain my guests while I cook. Who wants to be alone when they are grilling? I have a bar counter near theÂ BBQ that seats two people, but my raised planter can seat ten more! I love how I don’t have to rent dozens of chairsÂ for my get togethers. As a designer, it also gives me great pleasureÂ to seeÂ peopleÂ congregate in theÂ areas that I designated for seating. Another benefit of the seat wall in myÂ outdoor kitchen area is thatÂ it caps a raised planter for my vegetable garden. The native soil in my yard is clay and deficient in nutrients making a raised garden bed ideal. I don’t toil to prepare my soil for planting! 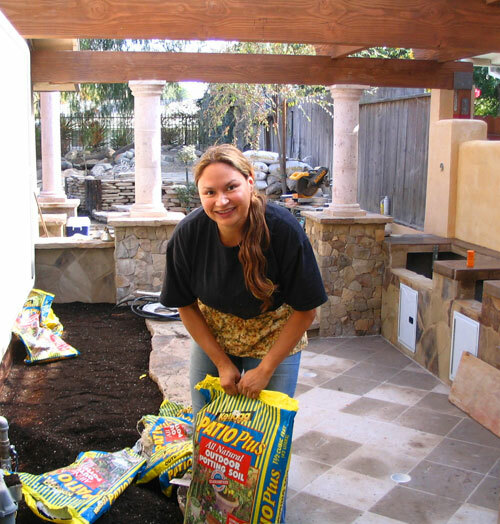 I just fill my raised garden planter Â with my favorite soil blend, (Kellogg’s Patio Plus ) and plant away. Weeds are not a problem in my garden. Built-in seating near a fireplace is practical. In this patio it also functions as a screen. TheÂ stone bench separates the spa area in the master bedroom retreat from the rest of the patio! Built in seating can also be used to separate areas of your patio and create different rooms and destinations. The long narrow patio runsÂ the span of the back of my house. I built the arched bench to create privacy and carve out a separate master retreat area with a “hidden” spa. Now my husband can take a dip while I have tea with my girlfriends on the other side! I’ve ever done this, but I could if I wanted to! 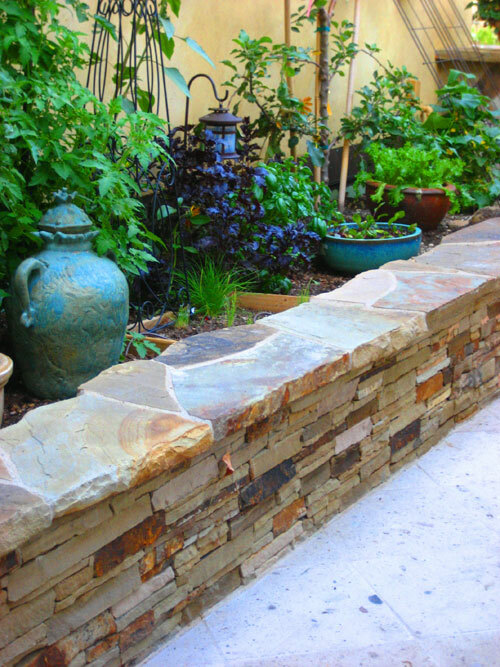 *ConstructionÂ by award-winning California landscape contractor,Â Southern California Landscape, master stone masons and builders 818.834.7241. Planning on adding an outdoor kitchen to your yard? Read about important considerations so that your new addition is functional, practical and beautiful. Edenmaker I love your blogs. I use them often in communicating ideas to my own landscaping customers. Keep up the good work! Go ahead and steal this look, we all borrow from one another anyway. My lawn has stopped knitting together as it has gotten colder. The UC Verde is holding on to the green color though some areas have lighted up a little. I’m hoping that the upcoming warmth in the Spring will cause it to completely knit together finally and green up! So far, not disappointed with the UC Verde but would have liked it to have meshed together already. Absolutely breathtaking! I completed one garden area to my liking and then ended up moving. It is great if you know you will be in one home and can complete such a fine project and then be there to enjoy it. Love the herb garden seating wall. I’m soooo going to steal that idea. BTW, how’s your Buffalo grass doing. Mine got hit with an early freeze and went brown. It doesn’t seem in a hurry to green up even though it’s been in the high 60s. Thanks for visiting and commenting.Los Angeles is garden weather. We do use our yard a lot and save on renting chairs for events with all the built in seating. I am so jealous of your patio, Shirley. Lovely! Good of you to point out the benefits of bench seating outdoors, especially when they’re part of your raised beds. Makes so much sense. Thanks Susan for visiting and commenting! How’ s it going? Any exciting projects to report about? Shirley, your garden is so gorgeous! I love the idea of a raised planter close to where the grilling and cooking action is. The thought of saying “hmmm, this steak could use a little taragon” and then reaching over to pluck some is too irresistible. Hi Barb, Thanks for visiting me at Eden Makers Blog! I visited your website- love the stone. Hope you come back to visit. Please keep posting the photos….. they’re wonderful inspiration! Link to me? Are you kidding Germinatrix…I can’t bring myself to refuse you after that wonderful comment, (plus I like you anyway). The words on your blog just pop off the screen and germinate the garden reader with reasons to smile. Drop in again sometime. I check your blog about once a week to see whats up. Talk about making edens, girl! I love how your blog unfolds like a tv show – you are a Garden Star! I’m going to link to you, okay? I just love what you are doing … thanks so much for stopping by and teaching me a thing or two! i can’t tell. Is that Brad Pitt or Tom Cruise in the spa? Did I mention it took me 4 years to complete! We worked on this project only on weekends while I tended to my clients and television garden makeovers the rest of the time. Sometimes, the cobbler and her kids have to wait! Thanks for the visi Angelat. I’ll be posting more photos of the gardens in future posts. You are definitely livin’ the life, Shirley! Your kitchen garden has an actual kitchen in it! And a spa! Dang!